Oarsman's wrist is a painful inflammation of the forearm that is caused by friction occurring at the site where four muscles of the forearm cross over each other. It's a common complaint amongst rowers (oarsmen). People who flex and extend the wrist frequently and forcefully are also at increased risk. The presentation of oarsman's wrist is very similar to that of De Quervain's disease. Both conditions have a very similar pain location and are difficult to distinguish from each other. Two extensor muscles of the wrist cross two extensor muscles of the thumb at a site approximately four to six centimetres above the wrist joint in the direction of the elbow. The tendons of these muscles are positioned close to each other. Each tendon is covered by a slippery sheath, which ensures that the tendons glide over one another easily. In the case of oarsman's wrist, we suspect that this covering - also referred to as the "tendon sheath" - is inflamed. 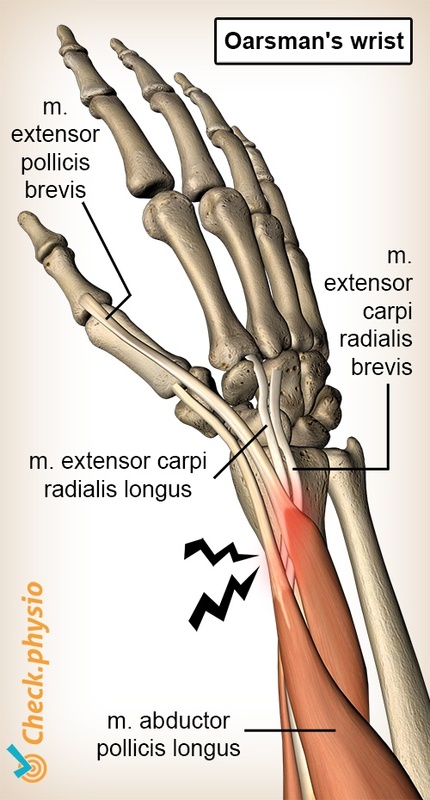 The muscles that cross each other are the extensor carpi radialis longus, the extensor carpi radialis brevis, the extensor pollicis brevis and the abductor pollicis longus (refer to image). Repeated forceful flexing and extending of the wrist is considered to be one of the causes. As a result, people who row, lift weights, do gymnastics or play a racket sport have an increased risk of developing oarsman's wrist. Pain on the upper side of the wrist or forearm, several centimetres above the wrist joint on the thumb side. Several movements can cause pain to the wrist, for example; flexing, extending and grasping objects. Sometimes this can be accompanied by a mild swelling or thickening on the upper side of the forearm. When flexing and extending the wrist, a crackling or crunching sensation can be present at the site where the tendons cross. Immobilisation of the wrist and thumb using a splint or cast. Corticosteroid injection in the tendon sheath. In exceptional cases, the inflamed tissue can be removed surgically. This is rarely necessary.